The Erna and Victor Hasselblad Foundation has selected Malian photographer Malick Sidibé as the winner of the 2003 Hasselblad Foundation International Award in Photography. The prize, consisting of SEK 500,000 and a gold medal, will be presented at a ceremony held in Göteborg, Sweden, on October 25, 2003. A new exhibition of Malick Sidibé’s work, curated and organized by the Hasselblad Center, will be opened in conjunction with the ceremony. Malick Sidibé has documented an important period of West African history with great feeling, enthusiasm and commitment. In his portraits and documentary photography, he has uniquely captured the atmosphere and vitality of an African capital in a period of great effervescence. From the very beginnings of the postcolonial period, he has been a privileged witness to a period of tremendous, euphoric cultural change. As a young but already well-reputed photographer, Malick Sidibé captured a time of paradigm shift and youthful insousiance, curiosity about the rest of the world, pride, and confidence in the future. 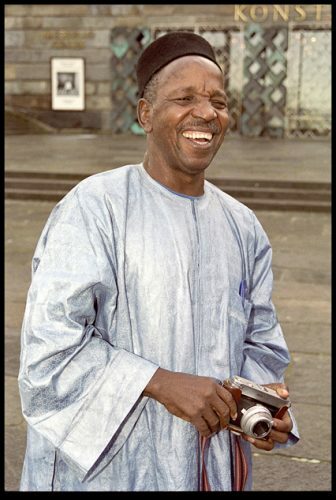 The work of Malick Sidibé, largely devoted to Malian youth in the 1950s and 60s, is a unique memoir and testimony. These photographs, originally intended for an African audience, are now available for the admiration of all. Mr. Sune Nordgren (chairman) director, BALTIC, Gateshead, England, Mr. Salah Hassan, professor and curator, Cornell University, New York, USA, Mr. Hans Hedberg, professor, Göteborg University, Göteborg, Sweden, Mr. Hou Hanru, curator, Paris, France, and Mr. Filippo Maggia, curator, Fondazione Sandretto Re Rebaudengo, Turin, Italy.